Every building whether residential or commercial has doors. They are probably the oldest and still the most effective access control systems. However, with the many door types that are available in the market, many builders and building owners have a hard time deciding what material will serve their purpose best. Steel is one of the most popular metals in the construction industry. It is preferred by many contractors for the following reasons. When a steel door is installed in the proper manner, it can serve a building for up to three decades. The metal has a high tensile strength, which means it can withstand a lot of force. When compared to options like wood and fiberglass, which have to be replaced after five to seven years of use, steel doors are really long lasting. It takes more effort to break down or interfere with a steel door than it could other common door materials. Statistics even show that buildings that have steel doors on their frames are less likely to face successful intrusions than those with other material types. The mere amount of work that it takes to bring down this type of door is enough to deter any burglar. It is precisely the reason why establishments like schools and industries use these doors. Stainless steel doors do not need complicated maintenance procedures. It is a great material because it does not rust, or get eaten by pests like mites and aphids. The smoothness of the service also means that it does not usually attract a lot of dirt. Most people that install the doors actually spend years before they have to think about the state of their entrances. 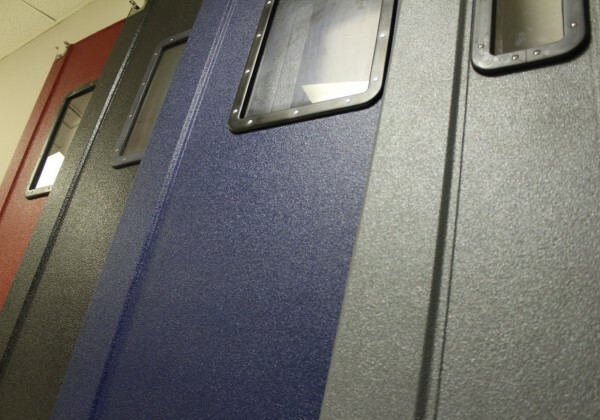 When you consider the limited maintenance procedures, the length of time that the door will serve you and the low cost of production, you will realize that steel is the most affordable door material out there in the market. As a building owner, you always have to worry about factors such as the fire safety of the building you are setting up. Of all the door types in the market, steel is among the most fire resistant. It has a 20 minute fire rating, which is quite impressive. Note that in case of a fire, when structures like doors get consumed in flames and collapse, the building becomes harder to get into for rescue efforts. With steel doors in place, at least there will be a chance to access the building, conduct rescue and if possible stop the fire. When insuring a building, the premium depends on the steps that you have taken to protect it against the risks. The great thing about investing in steel doors is that vandals will be kept out, lowering the premium on insurance against theft. Fires will be to the minimal, lowering that premium and the building will retain its integrity for long. As a result, the simple act of installing these doors will completely lower the premium you get to pay for it. Did you know that steel is the most recycled metal in North America? The companies that fabricate steel doors and frames try their best to incorporate recycled steel in the process. The great thing about steel and its durability is the fact that it does not grow weaker with reuse. Compared to materials like wood, which lead to cutting down of thousands of trees each year for sustainability, steel is the best material for doors.